This past weekend, I went to the South Austin Museum of Popular Culture to see their exhibit on Biscuit. I was very tickled to find this in the exhibit. Why? I sent this to Biscuit. I was in college, a huge Big Boys fan, and had a boring job sitting by a copy machine all day. This picture was in, I think, The Chronicle. I used the copy machine at work (no Photoshop or computer for me back then!) to copy this using the super high-contrast setting over and over again until I ended up with something that looked like a drawing. Then I colored it in with map pencils. I sent it to him and he sent me a postcard back. He must have kept this and that just made me so happy I’d done the fan-girl thing and sent it. 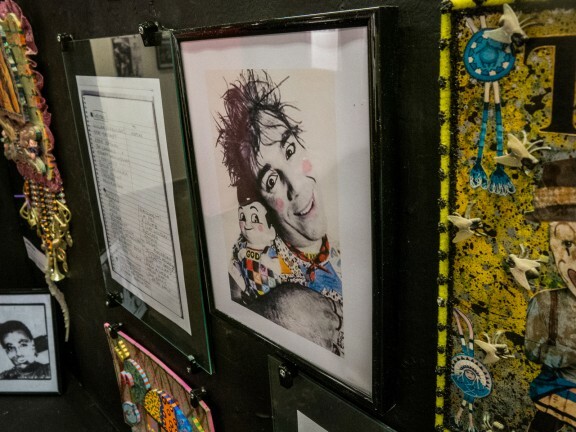 This entry was posted in Daily Photo and tagged in austin, big boys, biscuit, punk, south austin museum of pop culture.